the observatori: Orange-ya Glad for Queen's Day? Orange-ya Glad for Queen's Day? August 29 marked the end of the semester and, coincidentally the day before Queen's Day. So, about 60 of us headed up to Amsterdam to celebrate. 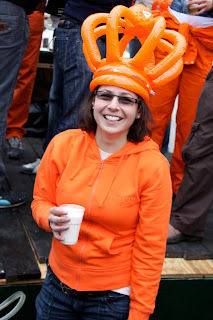 Queen's Day is the Dutch equivalent of the fourth of July. Just replace red and blue with orange, and hot dogs with beer. A 'quick' five hour drive had us in Amsterdam by 10pm, just in time to enjoy some Queen's Night celebration. On Queen's day, the canals fill up early with boats of orange-clad hooligans (myself included this time) to celebrate the orangest day of the year. I took off a bit early to catch my flight to India - but, by the looks of it, things were really just getting started. Gotta love Amsterdam.